This year’s Peppercorn Ceremony on April 24 will be enhanced with a VIP package, offering visitors a cultural experience they can’t get anywhere else, the BTA said, explaining that the package created high demand among visitors in 2018, nearly selling out in its pilot year. “The Peppercorn Ceremony VIP package sold very well last year and the visitor feedback was very positive,” said Bermuda Tourism Authority Product Development Manager Tashae Thompson. The BTA added. 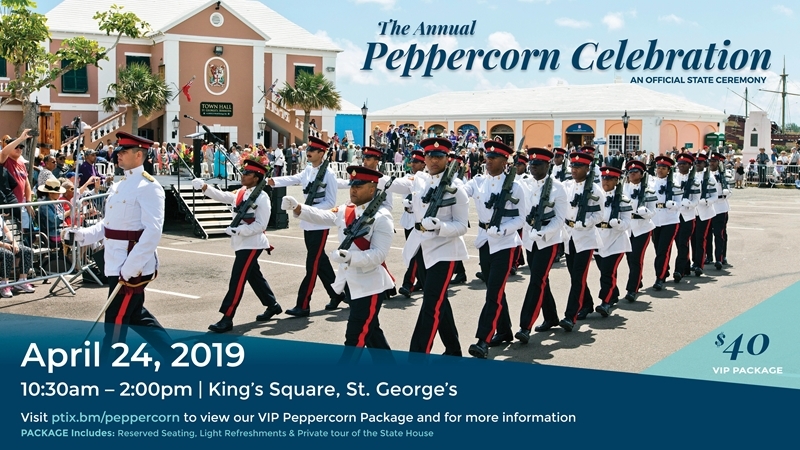 “While attending the ceremony itself will always be free for to all, the Bermuda Tourism Authority positions the VIP Peppercorn Ceremony Package as a way to elevate the visitor experience with a deeper understanding of cultural traditions. To book the VIP package, visit ptix.bm/peppercorn. The Peppercorn Ceremony takes place every April in St. George’s King’s Square, celebrating the unique moment when the Freemasons present the Governor with their annual rent: a single peppercorn. Full of pomp and circumstance, it features a parade full of officials and dignitaries, many arriving by horse-drawn carriages, along with military music and a classic Town Crier narrating the festivities. It did not sell out in it’s pilot year and many visitor’s thought it was over priced but all agreed it was a fantastic ceremony. Doesn’t say it sold out last year and everything’s expensive. Do you know what the cost was last year? Curious. This year it is $40 per ticket. That hardly seems over priced for what’s offered. $40 to a Cruise Ship Tourist IS expensive,but to Bermudians it’s not! And still the rent remains the same, one peppercorn. Amazing!